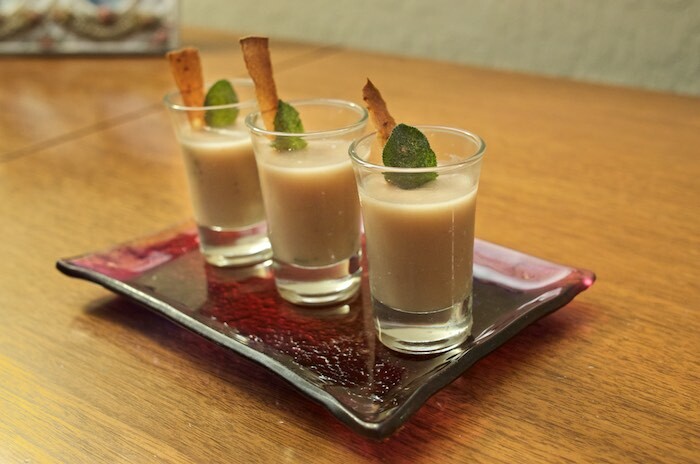 Soup shooters are a popular party appetizer that eliminate the soup course of a fancy meal, while tiding guests over till dinner. Usually served as passed hors d'oeuvres, in an array of shot or cordial glasses, they make a flavorful intro to any main course. Soups that can easily be sipped, like creamy and broth based ones, more often than not make good shooters. I recently made Jamie Oliver's Parsnip, Sage & White Bean Soup, a creamy creamless soup ideal for winter gatherings, and served it to guests in petite glasses. Garnished with fried parsnips & sage leaves it made quite the presentation. Heat olive oil in a pan over a medium heat, then cook the onion and parsnips for 10 minutes, or until softened but not coloured. Add the bay leaf, beans, sage and stock, season and simmer for 15 minutes. Taste for salt and pepper. For the crispy parsnips and sage, preheat the oven to 200º Peel and very thinly slice the parsnip. Brush the parsnip slices and sage leaves with oil, and bake for 5 to 10 minutes, checking often until crispy. Remove and discard the bay leaf from the soup, then cream it with a stick blender until smooth. Adjust seasoning and serve with parsnip and sage crisps on top. This looks like the perfect holiday starter course! I am a big fan of parsnips and love how simple this looks! What a fun idea for a starter! Soup shooters? I love this idea! There are so fun! Such a great idea! I've never tried a soup shooter but it sounds great! I love parsnips (especially in soup), and this flavor combo sounds excellent! What a fun idea and elegant way to start a dinner! What a great way to start a party! Love it! Parsnips are a favorite and great for a party! Perfect little appetizer! I love how easy this is too!